Another wet bank holiday weekend here (although it was sunny yesterday, so Jon got lots done in the garden), so we have been stuck inside with nothing to do but carve woodblocks, print, eat toasted fruit loaf and drink plenty of tea. 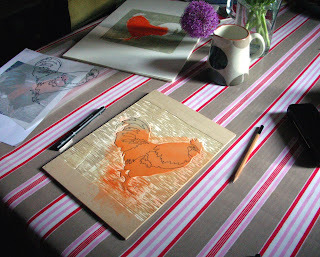 I have been busy carving and printing the next layer of a square print of a cockerel. The background colour and the first layer of his feathers are all printed, so today I did some cutting before printing the next layer of feathers - a dark orangey-red. It is working out very well at the moment, but will probably take at least a couple more weekends work before I manage to finish it. Jon is busy working this weekend, so hasn't had much time for art - but he is busy coming up with plenty of ideas for his entry for the 71st annual exhibition of the Society of Wood Engravers - the submission date for entries is in the first couple of weeks of July and both wood engravings and other types of relief print can be submitted. 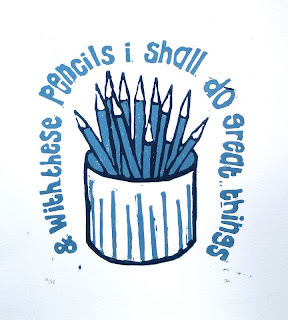 ...I shall do great things! 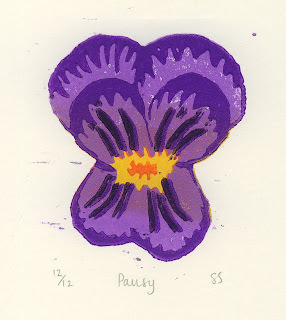 New prints from both of us today - a pot of pencils from Jon, and a little pansy from me. Both were done on lino - our first lino cuts for a while. 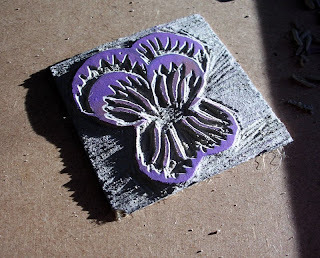 It was strange cutting lino again after doing so many woodcuts! It seemed much harder to cut (whereas I used to say that about wood), and it makes our hands smell of secondary school art classrooms. But, we still enjoyed it! I have also got going on another woodcut of a rather splendid cockerel against a sagey-green background. The background is all printed, and the outline of the bird is cut out, so hopefully this afternoon I'll find time to print the first layer, which will be a glorious orange. Jon is busy creating great things with his pencils and pens, and has a whole stack of ideas for prints for the next couple of months. 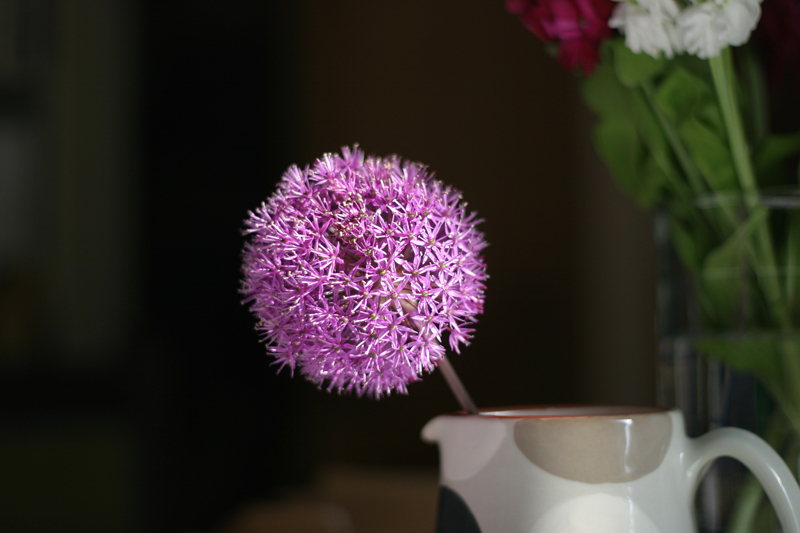 In the meantime we are going to have lunch in the garden and enjoy all the glorious sunshine we've been having!